Before Canadians can take De Schutter seriously, they ought to ask him some serious questions about whether his mission is about human rights or a political agenda. First, consider the origins of the UN’s “right to food” mandate. In voluminous background information provided by De Schutter and his local promoters, there’s no mention that their sponsor was Cuba, a country where some women resort to prostitution for food. De Schutter does not want you to know that Havana’s Communist government created his post, nor that the co-sponsors included China, North Korea, Iran and Zimbabwe. These and other repressive regimes are seeking a political weapon to attack the West. That is why the first person they chose to fill the post, when it started in 2000, was Jean Ziegler. The former Swiss Socialist politician was a man they could trust: In 1989, he announced to the world the creation of the Muammar Gaddafi Human Rights Prize. The award spread propaganda for its namesake, and elevated his ideological allies. Recipients include Fidel Castro and Hugo Chavez. In 2002, the prize went to convicted French Holocaust denier Roger Garaudy — and to Jean Ziegler himself. From 2000 to 2008, Ziegler’s UN reports and probes turned a blind eye to the world’s hungry. Instead he attacked America, the West, capitalism and Israel. The human rights council applauded him, and repeatedly renewed his mandate. Only because of term limits did they replace him in 2008 with De Schutter, who praises and emulates his predecessor. Second, even when they visit the right countries, Ziegler and De Schutter reach the wrong conclusions. Ziegler went to Cuba, but it was a staged visit that hailed Castro’s policies as almost divine. De Schutter went to Syria—in 2010, long before the current crisis — and mentioned several problems, but his report took pains to repeatedly praise the Assad regime. Like Ziegler, De Schutter has repeatedly made one-sided attacks on Israel lacking any nexus to his mandate. 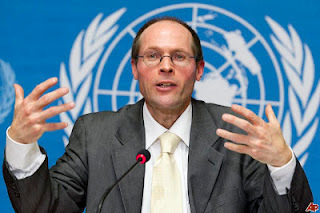 Last July, he issued a pre-emptive attack against his own boss, in a press release titled “UN Special Rapporteur opposes Ban Ki-Moon’s conclusions on flotilla.” De Schutter was outraged that a panel appointed by the UN chief found that Israel’s blockade of Gaza, to stop Hamas importing Iranian missiles, was actually legal — contradicting what De Schutter’s human rights council had said the year before. Hunger is a human rights issue. Tragically, what most interests De Schutter and his council is scapegoating the West. For the next two weeks, that means Canada. National Post, Hillel Neuer, originally of Montreal, is executive director of UN Watch in Geneva. Isn't is about time that we get rid of the UN? All the billions poured into an organization that is corrupt and now, it appears, controlled by the IOC. It is a disgrace!